Mary Ann Millikin was born in 1824. She married George Washington Parks, son of John Parks and Beulah Messenger, on 6 June 1847. Mary Ann Millikin married an unknown person circa 1867. Mary Carpenter was buried at Perry Cemetery, Tuscarawas Co., OH. She married George Washington Parks, son of John Parks and Beulah Messenger. Mary Carpenter was born on 27 October 1827. She died on 12 February 1846 at Perry Township, Tuscarawas Co., OH, at age 18. Mary Milliken was buried at Perry Cemetery, Tuscarawas Co., OH. She was born on 27 June 1827 at Greene Co, PA. She married John Madison Parks, son of John Parks and Beulah Messenger, on 13 December 1847 at Tuscarawas Co., OH. Mary Milliken died on 18 November 1862 at Tuscarawas Co., OH, at age 35. Lucinda Isophene Treakle was buried at Oswego City Cemetery, Labette Co, KS. She was born circa 1839 at Starke Co., OH. She married John Madison Parks, son of John Parks and Beulah Messenger, on 1 September 1867 at Tuscarawas Co., OH. Lucinda Isophene Treakle died circa 1907 at Oswego, Labette Co., KS. [S208] Dorothy Dean Viets Schell, Viets, Page 51. [S208] Dorothy Dean Viets Schell, Viets, Page 93. [S208] Dorothy Dean Viets Schell, Viets, Page 166. [S208] Dorothy Dean Viets Schell, Viets, Page 255. [S208] Dorothy Dean Viets Schell, Viets, Page 331. [S182] Social Security Death Index (on-line), Ancestry.com, SSDI, Ancestry.com, SSAN 387-16-6853. 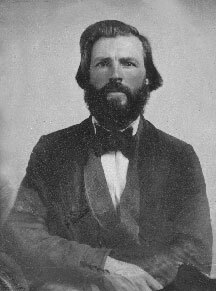 Lyman Hervey Cowdery was born on 23 November 1826 at LeRoy, Genesee Co., NY. He was the son of Warren A. Cowdery and Patience Simmonds. Lyman Hervey Cowdery married Sarah H. Holmes on 30 August 1849 at Kirtland, Lake Co., OH.1 Lyman Hervey Cowdery died on 24 March 1906 at Rochester, Monroe Co., NY, at age 79. Warren and Sarah E. were enumerated in the 1860 Olive, Cllinton Co., IA, federal census in the household of his father. He was a carpenter age 30, she was 26. Their children were Alma 7, Alfred 4, and James 2. "Nelson" and Sarah were enumerated in the 1870 Troy Groove, La Salle Co., IL, federal census. He was a farmer age 35, she was 35. Children iin the household were Alma 17, Frances 10, Alfred 14, and James 12. David Andrew Casassa, Jr., 53, of Granby beloved husband of Susan (Moulton) Casassa and loving and devoted father of Dylan M. Casassa and Caitlin M. Casassa died peacefully Saturday, (February 14, 2004) at Hartford Hospital after a courageous battle against pancreatic cancer. Born in Hartford on October 20, 1950, son of the late David A. Casassa, Sr. and Mary (McCullough) Casassa. He graduated from Granby Memorial High School in 1969 and received an associates degree from Northwestern Community College. David was employed at the Granby Public Works Dept. for 26 years. A cross country runner in high school he held many records and was an avid runner with his wife in the McLean Game Refuge and in local road races including the Boston Marathon. A devoted father he coached in the Granby little league, soccer league and girl's softball league. He was a talented builder and woodworker having built his family home and barn on their property and also made many pieces of furniture for their home. An avid outdoorsman he loved his home, flower and vegetable gardens that he planted and maintained, as well as cross country skiing with his family on their property. David attended with his wife and family the First Congregational Church in Granby. Besides his beloved wife Susan and son Dylan and daughter Caitlin he leaves a brother and sister-in-law, Andrew and Rita Casassa of Granby; a brother-in-law, Carlton Holcomb of Norfolk; his father-in-law, Frank Moulton of Florida; a sister-in-law and brother-in-law, Barbara and Ed Guarco of Granby; and nieces and nephews Courtney Casassa, Brittany Casassa, Kailey Casassa, Bart Holcomb, Arber Holcomb, Zack Holcomb, and Cathy Guarco. Besides his parents he was predeceased by a sister, Susan Holcomb. A Memorial Service will be held Wednesday, February 18, at 1 p.m. at the First Congregational Church, 219 North Granby Rd., Granby with the Rev. Daniel Schroeder officiating. His family will receive friends Tuesday, from 4-7 p.m. at the Hayes-Huling & Carmon Funeral Home, 364 Salmon Brook St., Granby. In lieu of flowers, memorial donations may be made to the Pancreatic Cancer Action Network, (PanCan) 2221 Rosecrans Ave., Suite 131, El Segundo, CA 90245. [S284] Courant, February 16, 2004. Child of Lucy Prescott and Jonathan Fay Jr.